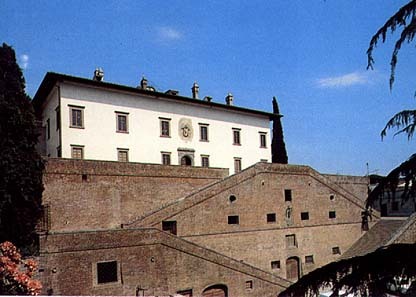 Built for Cosimo de' Medici, Medici, first Grand-Duke of Tuscany: in 1565, the villa was terminated with the collaboration of Buontalenti, who designed the imposing staircase known also as "Ponti Medicei". Sadly famous as the scene of the murder of lsabella de' Medici, the residence was planned as a stropover and the way to the other villas in the area. Various changes were made in the course of the centuries and it was also plundered after being used to garrison troops during the last war. It is now the seat of a museum which contains various portraits of the members of the Medici family, as well as a selection of period furniture.